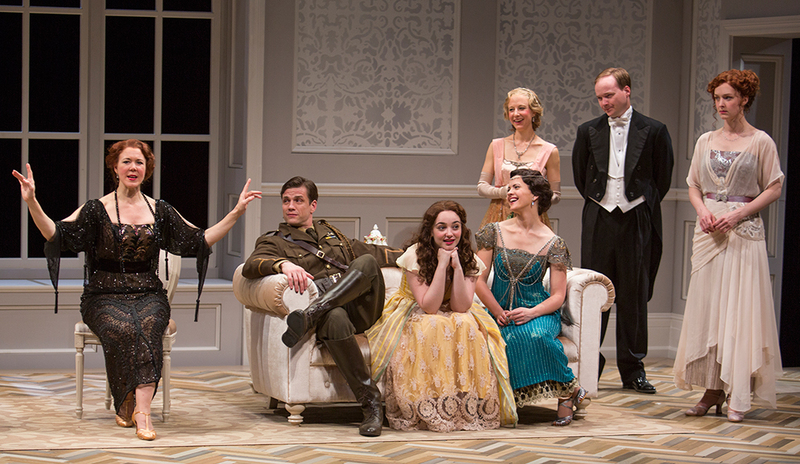 True to its name, in “Time and the Conways,” time plays as big a role as the titular family. When we first meet them, it’s 1919, the “War to End All Wars” is over, and spirits are as fizzy as the party drinks being served. It’s Kay’s 21st birthday and all six Conway offspring have high hopes for a bright future. But if you listen closely, there’s foreshadowing of not-so-rosy things to come. The family wealth is obvious, as is the supercilious classism. The Conways are big fish in their small Yorkshire town, and despite their mother’s frank favoritism and casual cruelty, all the children show promise. No sooner does the party (which we’ve viewed from the back room, the staging-ground for an elaborate game of charades) come to an end, than the room recedes and its later, shabbier doppelganger takes its place. Eighteen years have gone by, and another war is looming. It’s 1937, Kay is turning 40, and she has settled and compromised, as have her sibs. No one’s where they’d hoped they’d be, even if they got what they wished for. The family fortune has been squandered, the beloved manse must be sold off, and the future looks rather bleak. There were dim premonitions earlier on, and in the final act, we get to revisit that first scene, with fresh eyes. J.B. Priestley (1894-1984) is perhaps best known for his 1946 mystery, “An Inspector Calls,” another one of his “Time Plays,” which were influenced by “An Experiment with Time,” an essay by Irish aeronautical engineer J.W. Dunne, who posited the idea that past, present and future are inextricable; linear time, Dunne felt, is the only way time can be perceived by human consciousness. But in dreams, we can have access to other perspectives. “Time and the Conways” (1937) gives Old Globe designers another opportunity to create a sumptuously costumed period piece, at which they excel. The set, while imaginatively malleable, is not as luxurious or extravagant as expected, given the family, storyline and promotional materials. But the cast looks gorgeous (costumes by David Israel Reynoso), as each actor inhabits his or her more or less eccentric character with perfection, morphing from sanguine to cynical and back again. It’s lovely ensemble work, astutely directed by Rebecca Taichman. Priestley’s dramas play with form – and audience expectations. Here, as in “Inspector,” things don’t turn out to be what they seem at first glance. But “Conways” takes a more cosmic outlook: Life can’t be viewed moment-to-moment. Any given instant is a rich, simultaneous temporal experience. Though the conceit is a tad esoteric, you could say the concept is timeless – or at least, well-timed. 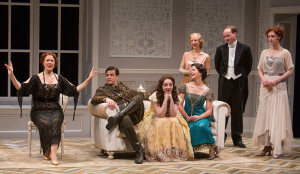 “Time and the Conways” runs through May 4 in the Old Globe Theatre in Balboa Park. Performances are Tuesday and Wednesday at 7 p.m.; Thursday-Saturday at 8 p.m.; Sunday at 7 p.m.; matinees on Saturdays and Sundays at 2 p.m. Additional matinee on April 23; no matinee on April 26.